This Bicycle Brand Svengali Deck allows you to do Magic Tricks that require absolutely no skill. And, while the deck is ridiculously easy to use, it is also the most likely one that you've seen on TV being used by leading Magicians. 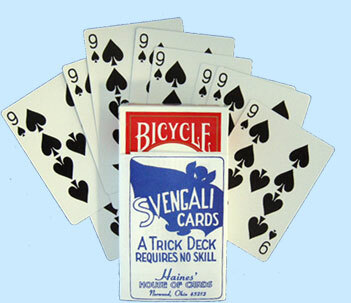 With Bicycle Svengali Decks, you can have a spectator choose a card from what looks like a regular Bicycle Poker Playing Card Deck – no one will be able to Trick Cards from regular ones. However, when the chosen card is returned to the deck, the entire deck changes to match the card! In addition, more experienced magicians can use the Stripper Decks to perform hundreds of other Card Tricks, and each deck includes instructions for six great Magic Tricks.